July 13, 2012 – Newbury Park, CA – Opto Diode, a division of ITW, and a member of the ITW Photonics Group, introduces the ODD-900-001, a surface-mount photodiode with a daylight filter. 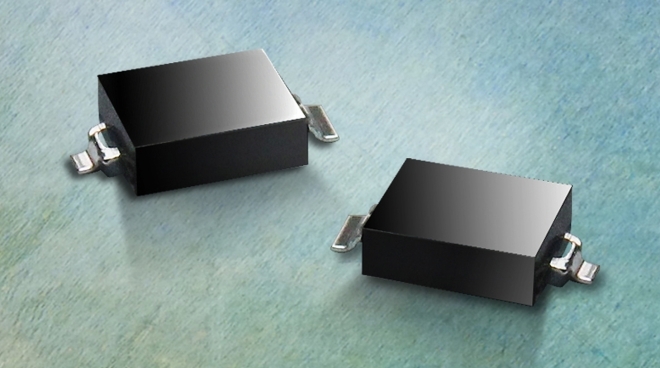 The new photodiode offers low capacitance and short switching time in a surface-mount package, making it ideally suited for industrial photoelectric control applications. It features high sensitivity ranging from 730 nm to 1100 nm spectral range, with peak sensitivity at 940 nm. The electro-optical characteristics at 25 degrees C offer typical responsivity of 0.44 A/W, typical reverse dark current at 5 nA, total capacitance at 25 pF, and typical rise/fall times of 50/50 nSecs. Opto Diode’s new ODD-900-001with daylight filter is highly durable and designed for use in a wide variety of industrial detection tasks. It operates from -25 C degrees to +85 degrees C; the storage temperature range is between -40 degrees C and +85 degrees C. Power dissipation is 150mW at (or below) 25 degrees C (free air temperature). Reliable and rugged, the new device also features a soldering temperature of 260 degrees C (soldering time is 5 seconds, maximum). Available for shipping now, Opto Diode’s new daylight filter surface mount photodiodes are priced at $1.05 per 1000 (minimum order of 1000). For more information, please visit: http://www.optodiode.com/pro_07.html. Opto Diode Corporation based in Newbury Park, California, is a member of the ITW Photonics Group, delivering high-performance, standard and custom photodetectors, and reliable, high quality, standard and custom infrared and visible LEDs. The company, with the recent acquisition of International Radiation Detectors, also designs and manufactures semiconductor radiation devices that detect photons in the UV range, X-rays, and other high energy particles.